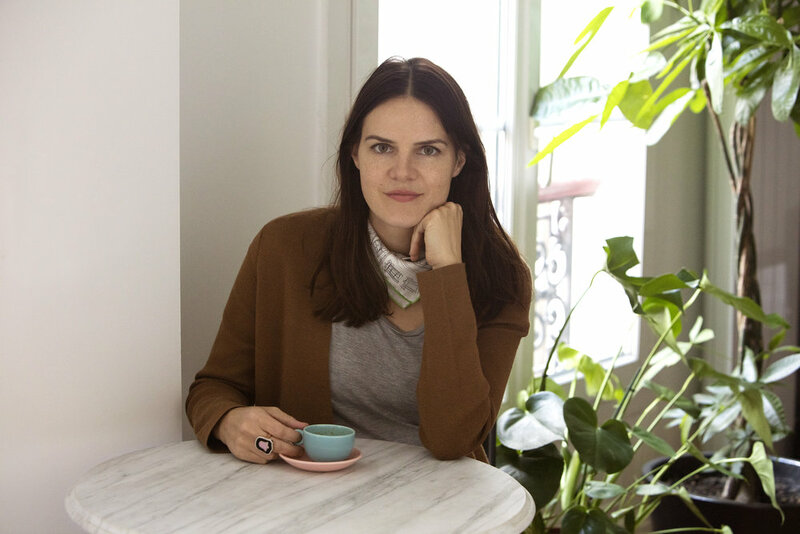 Miriam is a designer and a creative director, in partnership with the brand Mimi Vert, and co-founder of the design studio The Garden Apartment. Born in Switzerland she grew up in open air roaming the snowcapped peaks. She then lived in Puerto Rico and New York, and settled in the 10th district of Paris three years go. Top: Odlo. Shorts: Under Armour. Shoes: Superga. All Images by Corinne Stoll. She has a passion for transforming two dimensional surfaces into 3D objects, partial to an artisanal touch and has a particular interest for upcycling. She aims to create products that have a positive influence on consumers encouraging them to be responsible. 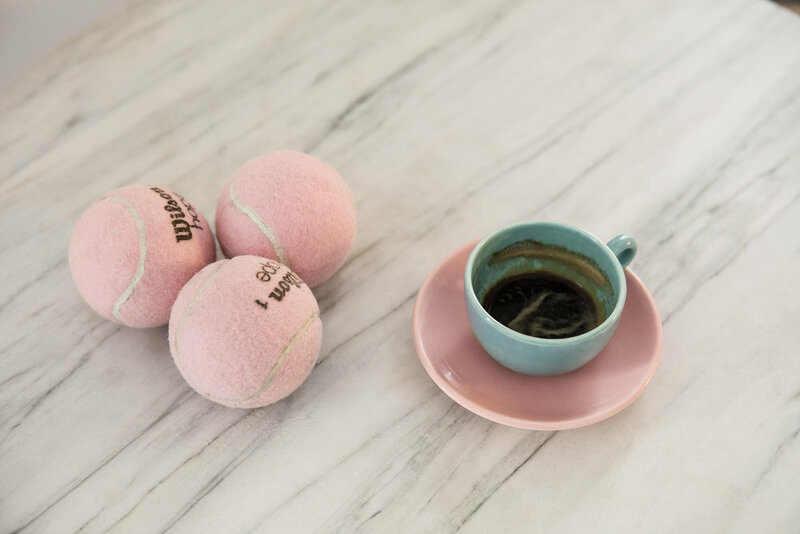 Between productions, she plays tennis, practices yoga and gets around on her bike. 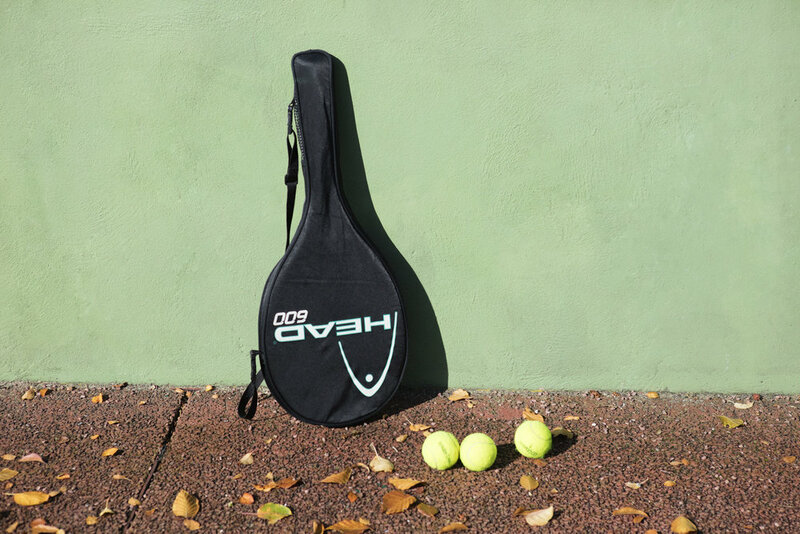 Inside/Out: What is the first sport you played? A first memory? Miriam: My father was a mountain guide and at a young age he started bringing my sister and I along to climb and trek. We loved the adventurous nature of the challenge; we were really committed and competitive. M: Most likely it was mountain climbing, even if I ended up giving it up when I was an adolescent to strictly focus on athletics. I was a 100 meter sprinter, and competed in both the high and long jump. M: Nicole Niquille the first woman mountain guide. While trekking she was paralyzed by a head wound inflicted by a falling rock. Regardless of this handicap she created a bed and breakfast in the mountains of Lausanne and even a charity hospital in Nepal. I have rarely met another person with as much character, optimism and generosity. Tee-shirt: Odlo. Shorts: Under Armour. Polo: Lacoste. Pants: Uniqlo. Shoes: Superga. Racket: Head. I/O: A lasting memory in sports? M: The satisfaction and emotion of summiting a mountain after several hours of climbing. The picnic that followed is very rewarding as well. M: I love new challenges. I started playing tennis recently, the opposite of Mountain climbing and what I am familiar with. Even though it can appear simple it is a real psychological and technical challenge, as I don’t have the foundation, automated muscle memory like my partner who has played since he was young. M: The most important thing is being active daily. A real quality of life is synonymous to getting around without a car or public transport. I am lucky to live in the 10th district and to work from home – everything is nearby. I walk a lot, going on errands, lunches, to exercise, to pick-up my daughter from daycare. I take my bike for professional meetings, this way I observe, absorb and am inspired by the city for my work. Bra: Odlo. Racket: Head. Bottle: Sigg. M: Contrary to the New Yorker, the Parisian has a more relaxed and offbeat approach to exercise. Even if she trains seriously, she will also find a moment to drink wine, have a cigarette or eat pastries, things a lot of Americans wouldn’t grant themselves. M: I have only lived in Paris for 3 years but already in this short lapse of time I have seen change, people are more conscious, more sensitive to the fact that regular exercise is an absolute necessity for a balanced life…I find they are more and more runners on the streets. The arrival of spin classes is also a strong sign. It is a sport that requires a high level of commitment. M: You definitely see more tennis shoes being worn on the street than 10 years ago and sportswear has made its way as a style in ready-to-wear collections. I/O: What's the French Touch of sports? M: The pool, I am impressed by the number of public pools in Paris! Cardigan: Uniqlo. Scarf: Hermès. Ring: Mimi Vert. Tee-shirt: & other Stories. Tennis Balls: Wilson. Jewelry: Mimi Vert (Miriam's collection). Perfume: Hermès. Shampoo, soap & deodorant: Aesop. Toiletry Bag: Issey Miyake. I/O: Exercise solo or in a group? M: As two or in a group! M: I like retro sports outfits and a little preppy, styles I can also wear daily. M: A pleated mini skirt for tennis during the summer. I/O: Dressed in black from head to toe or color? M: To exercise in, I like neutral colors, perhaps if I improve my tennis game I will dare to wear more striking colors! I/O: Exercise before and after rituals? M: A big macaron, red fruit flavor, after exercise and a warm bath following! I/O: Do you feel that women support themselves more today and excel together? M: I more than admire the women who were a part of the first feminist movement, and today there is still a lot of progress to be made. It is really important that women mutually support one another. When my daughter will be older, I hope there will be more women who set an example than there are today. 1 tip: find one or more partners to practice with, for yoga it is motivating and essential for tennis. 1 power song: "Cool Cat" by the Queens. 1 blog: www.paris.fr/tennis to choose and book your class. 1 restaurant address: La Chemise, for a well-deserved lunch or dinner after exercising. 1 beverage: Iced green tea. 1 beauty essential: A hot and revitalizing bath by Weleda, pine tree scent. 1 person we should interview: Stella Lee Prowse in NYC.